Moving hands differently (ie hand independence) is one of the biggest challenges in piano, for both beginners and advanced players. For beginners, the challenge is making sure your hands don’t copy each other (where one goes, the other follows). For advanced students, it’s being able to make 3 or 4 part melodies and harmonies come through clearly, with correct volume and phrasing. An example I like to use is: Can you pat your head and rub your belly at the same time? That’s hand independence. That’s basically what we have to do x100 on piano. Today’s piano exercises are made for relative beginners. I wouldn’t give them to someone just starting – if you can play a C major scale with both hands fairly well, then you’ll be able to handle these exercises. Just to make sure you’re at that level, I did a video on 5-finger scales, which you can check out here. Once you’ve got the hang of those, check out this video on the C scale. In that video we don’t do the C scale with both hands, but it walks you through the finger patterns if you need a refresher. As always, I’ve got a piano exercises PDF up on the blog, so you can print them out and try them, or load them up on your tablet or however you like to do these things. Today we’ll look through each of the 5 piano exercises, and talk about their purpose – why I bothered to include them. I’ll also show you how to play them, of course! 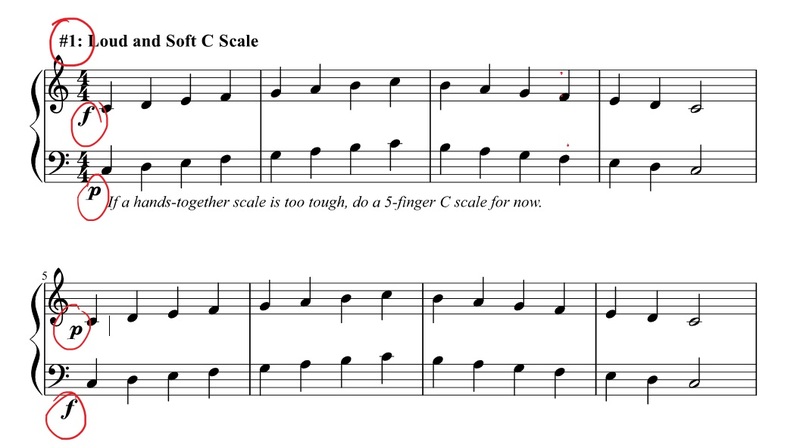 The first exercise is a two-handed scale. But instead of playing C scale with both hands and calling it a day, we’re going to go a step further. In the first part of the piano exercise, the right hand is loud while the left hand is quiet. This is very difficult! 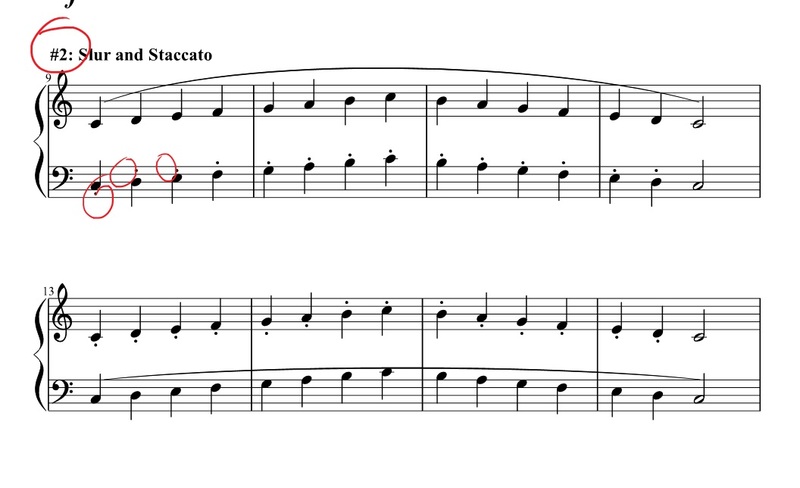 The roles reverse in the second line (left loud, right quiet). I’ve used this simple but powerful exercise in my studio a lot. The reason is that skilled playing often requires your hands be at different volume levels. Like say you’re playing a basic melody/chords song. What’s the most important part? The melody, of course. The melody needs to ring out – if it gets lost in the chords, no one will know what song you’re playing. So you need to play the melody louder. A lot of people don’t know how to do this – it certainly doesn’t come naturally to most of us. And sometimes it can be very difficult to learn the technique while you’re also learning a song. So I’ll have my students do this finger exercise. This exercise is similar to #1 in a couple of ways. It centers around a C major scale, played by both hands. But instead of changing the volume, this time we’re playing legato and staccato. I teach this technique about as commonly as #1. It’s simple to understand – one hand plays smooth while the other plays staccato – but difficult to execute. Your hands will really want to copy each other. Give it time, and don’t neglect this one – so many pieces require us to use this kind of coordination for them to sound right. Next, we’re going to go in a completely different direction and take a look at a canon. 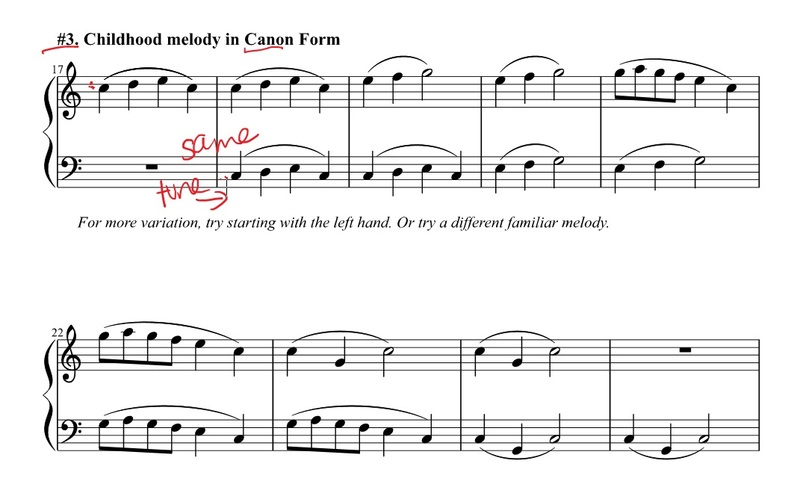 A canon in music is where one hand leads, and then the other one copies it exactly, usually by a delay of one bar. So as you can see here, we first do the tune in the right hand (which is Frere Jaques), and then the left hand comes in with the tune a bar later. Again, it’s easy to understand, but difficult to execute. Being able to master this technique with simple kids’ songs will take you in the direction of evolving to Bach’s inventions, which are pretty much a staple collection of piano teachers and students everywhere. Because once you master the inventions, you can master the sinfonias. And once you’ve mastered the sinfonias, you can master the Crème de la Crème of piano music – Bach’s Preludes and Fugues. Our fourth piano exercise switches up the rhythm. We’ve simplified the pattern for this one – just a C 5-finger scale instead of a full octave scale – but if you master this one, challenge yourself by playing it a full octave. This one is tricky because one hand is moving steadily, while another hand is doing dotted and 8th notes. You’ll notice that the 8th notes don’t align with anything – they’re played in between the quarter notes, and that is the main challenge of this exercise. Our fifth and final exercise today is a variation on #4. It’s the exact same notes – you’ve got a steady rhythm in one hand, and a dotted/8th rhythm in the other – but the articulation changes. In my mind, this is the most difficult of all the exercises, because it’s bringing in components of the other ones. One hand is staccato while the other one isn’t. You’re doing slurs in one hand, but not constant slurs – short slurs that require a break in the sound between each set. I didn’t mark this on the score, but you can make it more challenging by also playing one hand louder or quieter than the other. Just a quick note on Hanon exercises – I know a lot of people really enjoy these, so if you’re looking for alternatives or more ideas, you can check out The Virtuoso Pianist. I’m personally not a huge fan of them – I’d rather do finger exercises that still have musical value. But some people swear by them. Another option are Czerny’s many, many finger exercise collections. I quite like these, as you learn various piano techniques through songs, not just repetitious patterns. I’ve done some videos on Czerny and his exercises, if you’d like to go beyond the 5 piano exercises we talked about today. If you’re interested and learning more about Hanon and Czerny and why I prefer one and not the other, you can check out the Hanon vs. Czerny Showdown video. If you’re basically a complete beginner, and these piano exercises are still a little much for you (and no shame if that’s the case! ), you should check out this article by my friends over at TakeLessons: It’s got 8 different ideas for piano exercises, with a bit of overlap of what we’ve already talked about, but mostly simplified. You can also check out the play-through video I did on Bartok’s Mikrokosmos – it’s a collection of pieces starting from a complete beginner level, getting progressively more challenging. They’ve got a really interesting sound (you’ll get it if you know anything about Bartok) and they’re not for everyone, but they’re also great for getting your hands independent. If you’re well past the beginner stage, and all of these exercises are way too easy for you, the gold standard of hand independence training are Bach’s 2-part inventions. A 2-part invention is basically where one hand leads, and the other hand follows. Kind of like an advanced form of Exercise #3. His inventions are around a grade 7-8 level, and are quite difficult if you’ve never spent much time with Baroque music, or music where you have to do drastically different things with your hands. Thanks for stopping by today, and I’ll catch you next time!